Clint Heinze -- Students must take the responsibility to protect themselves. California Baptist University is known for its beauty and being consistently ranked among the top southern California schools. It is also known for its constant pursuit of student safety. Jim Walters, the director of Public Safety, and his entire department strive to make CBU safer each year. The 2011-2012 school year is no different, as special attention must be given to construction projects and the parking issues they cause. One particular problem the Public Safety office has encountered is bicycle thefts across campus due to the use of inadequate locks to secure bicycles. With little serious crime this semester, the bicycle thefts have been the most exasperating. “The bicycle thing is annoying and frustrating because it is almost completely preventable by the use of proper locks. It hurts to watch students lose property when it does not have to be that way,” Walters said. Another recurring crime on campus is consistent break-ins to student apartments. This, according to public safety mass e-mails, is primarily due to unlocked doors and windows. 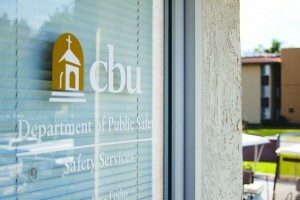 Students feel very comfortable around campus and would like CBU, “to be safe enough to do that. What we say in return is we want it to be that safe, but the reality is it is never going to be that sort of environment,” Walters said. If non-students are the culprits, keeping doors unlocked could spark them to return due to past luck with other apartments. “My belief is, at least in the most recent incidents, it is not an outsider, but if you teach people to find unlocked doors, they will do it,” Walters said. These crimes of convenience can be avoided by simply locking doors and windows securely before leaving residences. As far as further plans to maintain a secure campus go, the department is in constant alert. It is a year-round project to take certain steps to keep the campus safe by looking into recent incidents and monitoring patrol in certain areas.